St John’s Wort is a perennial herb that grows up to 60 cm in height. It has bright yellow five-petalled flowers with long stamens. The plant can be found growing successfully in both urban and rural ecosystems. You can easily locate St John’s Wort in open, well-lit areas such as parks, roadsides and abandoned corners of the city. Perforatum means ‘perforated’ as St John’s Wort’s elliptic leaves are scattered with translucent glands and sometimes with dark dots. Allen, David E., und Gabrielle Hatfield. 2012. Medicinal Plants in Folk Tradition. Timber Press, Incorporated. Hatfield, Gabrielle. 2007. Hatfield’s Herbal. London: Penguin/Allen Lane. Bombardelli E, Morazzoni P. Hypericum perforatum . Fitoterapia . 1995;66(1):43-68. Hahn G. Hypericum perforatum (St. John's wort) — a medicinal herb used in antiquity and still of interest today. J Naturopathic Med . 1992;3(1):94-96. Wurglics M, Schubert-Zsilavecz M. Hypericum perforatum : a 'modern' herbal antidepressant: pharmacokinetics of active ingredients. Clin Pharmacokinet . 2006;45(5):449-468. Bennet DA Jr, Phun L, Polk JF, Voglino SA, Zlotnik V, Raffa RB. 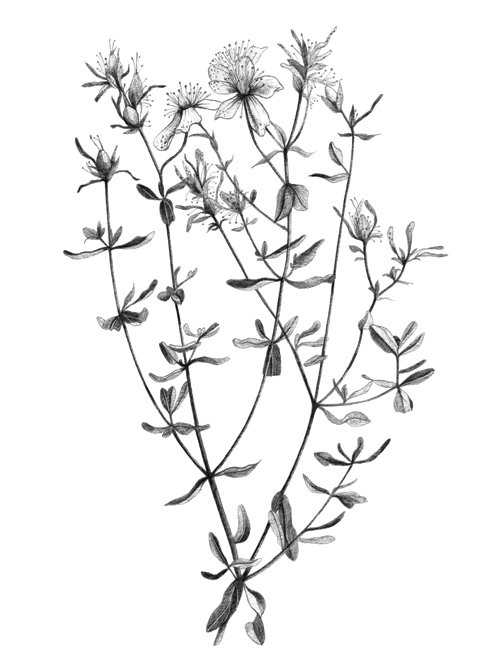 Neuropharmacology of St. John's wort ( Hypericum ). Ann Pharmacother . 1998;32(11):1201-1208. Barnes J, Anderson LA, Phillipson JD. St. John's Wort ( Hypericum perforatum L.): a review of its chemistry, pharmacology and clinical properties. J Pharm Pharmacol . 2001;53(5):583-600. Uzbay TI. Hypericum perforatum and substance dependence: a review. Phytother Res . 2008;22(5):578-582. Uzbay IT. Serotonergic anti-depressants and ethanol withdrawal syndrome: a review. Alcohol Alcohol . 2008;43(1):15-24. De Vry J, Maurel S, Schreiber R, de Beun R, Jentzsch KR. Comparison of Hypericum extracts with imipramine and fluoxetine in animal models of depression and alcoholism. Eur Neuropsychopharmacol . 1999;9(6):461-468. Lawvere S, Mahoney MC, Cummings KM, et al. A Phase II study of St. John's Wort for smoking cessation. Complement Ther Med . 2006;14(3):175-184. Upton R, ed. St. John's wort Hypericum perforatum . Scotts Valley, CA: American Herbal Pharmacopoeia and Therapeutic Compendium; 1997. Newall CA, Anderson LA, Phillipson JD. St. John's wort. In: Herbal Medicines: A Guide for Health-Care Professionals . London, England: Pharmaceutical Press; 1996:250-252. Sardella A, Lodi G, Demarosi F, Tarozzi M, Canegallo L, Carrassi A. Hypericum perforatum extract in burning mouth syndrome: a randomized placebo-controlled study. J Oral Pathol Med . 2008;37(7):395-401. Wickersham RM, Novak K, managing eds. Drug Facts and Comparisons . St. Louis, MO: Wolters Kluwer Health, Inc; 2005. Gulick RM, McAuliff V, Holden-Wiltse J, et al. Phase I studies of hypericin, the active compound in St. John's wort, as an antiretroviral agent in HIV-infected adults. AIDS Clinical Trials Group Protocols 150 and 258. Ann Intern Med . 1999;130(6):510-514. Jacobson JM, Feinman L, Liebes L, et al. Pharmacokinetics, safety, and antiviral effects of hypericin, a derivative of St. John's wort plant, in patients with chronic hepatitis C virus infection. Antimicrob Agents Chemother . 2001;45(2):517-524. Hicks SM, Walker AF, Gallagher J, et al. The significance of “nonsignificance” in randomized controlled studies: a discussion inspired by a double-blinded study on St. John's wort ( Hypericum perforatum L.) for premenstrual symptoms. J Altern Complement Med . 2004;10(6):925-932. Stevinson C, Ernst E. A pilot study of Hypericum perforatum for the treatment of premenstrual syndrome. BJOG . 2000;107(7):870-876. Grube B, Walper A, Wheatley D. St. John's wort extract: efficacy for menopausal symptoms of psychological origin. Adv Ther . 1999;16(4):117-186. Knuppel L, Linde K. Adverse effects of St. John's wort: a systematic review. J Clin Psychiatry . 2004;65(11):1470-1479. Schulz V. Safety of St. John's wort extract compared to synthetic antidepressants. Phytomedicine . 2006;13(3):199-204. Clauson KA, Santamarina ML, Rutledge JC. Clinically relevant safety issues associated with St. John's wort product labels. BMC Complement Altern Med . 2008;8:42. Stevinson C, Ernst E. Safety of Hypericum in patients with depression: a comparison with conventional antidepressants. CNS Drugs . 1999;11(2):125-132. Dugoua JJ, Mills E, Perri D, Koren G. Safety and efficacy of St. John's wort (hypericum) during pregnancy and lactation. Can J Clin Pharmacol . 2006;13(3):e268-276. Gregoretti B, Stebel M, Candussio L, Crivellato E, Bartoli F, Decorti G. Toxicity of Hypericum perforatum (St. John's wort) administered during pregnancy and lactation in rats. Toxicol Applied Pharmacol . 2004;200(3):201-205. Greeson, J. M., Sanford, B. & Monti, D. A. St. John’s wort (Hypericum perforatum): a review of the current pharmacological, toxicological, and clinical literature. Psychopharmacology (Berl.) 153, 402–414 (2001). Öztürk, N., Korkmaz, S. & Öztürk, Y. Wound-healing activity of St. John’s Wort (Hypericum perforatum L.) on chicken embryonic fibroblasts. J. Ethnopharmacol. 111, 33–39 (2007).